Lauren Looft writes about her experiences with Ranger Peter Meyer on a Cool Dingo Tour of Fraser Island. Excerpt taken from letstravelradio.com. Posted 6 September 2010. The Outback, The Opera House and Bondi Beach: All iconic images associated with Australia. And although they are fabulous sights to be seen, after studing aboard in Australia for four months I've come to realise that there's more to Australia than what we may think. 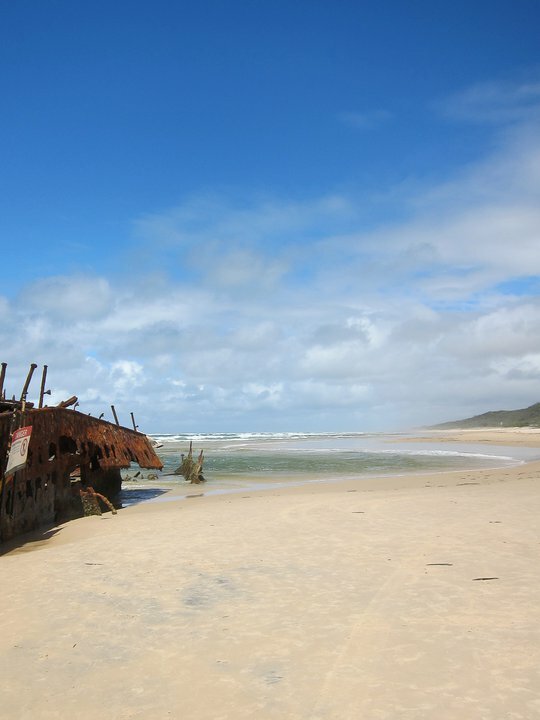 One of my most memorable excursions was to Fraser Island, an island found along the southern coast of Queensland. Most notably, it is the largest sand island in the world, and the only place where an ancient yet thriving rainforest can be found growing on sand dunes at elevations of over 200m. Getting around the island is difficult - four-wheel-drive vehicles are the primary means of transportation to navigate the sandy dunes, but the harsh trails are a piece of cake for the expert tour guides. We signed up for a http://www.cooldingotour.com/ where our guide Peter kept us on the edge of our seats as he literally twisted aroudn the tall trees and dangerous dunes. After an exciting four-wheel-drive adventure, we walked through the forest to reach Basin Lake - an eight metre black water perched lake. The water was so warm and perfect for a quick dip, before taking off on a 2.5 hour nature walk. Another area of interest is Central Station - which used to be the island's centre of forestry operations in the 1960s. After hiking in the rainforest for most of the day, our next stop was Lake McKenzie. Also a perched lake, Lake McKenzie is situated atop a sand dune 100 metres above sea level. The lake was absolutely picturesque, something from a travel brochure. Crystal-clear waters, with pure white sand. The sand is so fine that travellers can use it to clean jewellery with. We spent the night in a shockingly nice hostel. The lodges were cute and clean and spacious. Only a few minutes away is a lookout point that is perfect to watch the sun set. Dinner was served at the Dingo Bar, where entertainment was provided afterwards; or you could spend a quiet night with friends having a few drinks and playing pool. The next day we found ourselves taking a drive along what is known at 75-Mile Beach, an endless stretch of crashing waves and the occasional brave fisherman standing in the surf. 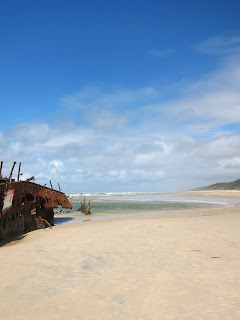 Our guide took us to the Maheno Shipwreck - a ship that crashed on Fraser Island during a cyclone (see above pic). At this point tourists were offered the chance to take a plane ride that takes off from the beach, flying above the island for approximately 15 minutes, allowing visitors the chance to see sights not easily reachable from the ground. The most impressive was Butterfly Lake - a lake in the shape of a butterfly. The most stunning place on Fraser Island is the Champagne Pools which are natural rock formations in the ocean that create a sort of lagoon on the coast. With the rocks protecting us from the many breeds of sharks swimming along the coast of Fraser Island, we could still experience the feelign of being in the ocean and enjoy the moment when waves crashed over the rocks, spilling in to the pools. Next we climbed to Indian Head rock - a rock supposedly named by Captain James Cook when he sailed to Fraser Island in 1770 and saw the native aboriginals watching his ships approach. The rock, which juts out over the ocean, allows for an excellent view of marine life below. Shadows of sharks are easily discernible from above. I was content to just sit and appreciate the power of the ocean. As we made our way to our final destination, we came across a wild dingo roaming along the beach. Our guide stopped the bus and allowed us to crowd around outside and observe. The dingo came surprisingly close to us, probably used to the presence of tourists on the beach. After taking some pictures, we boarded the bus and drove to Eli Creek, a continuously flowing fresh-water creek that opens into the ocean. We walked to the top and ended our trip with a beautiful and relaxing float down the creek. Getting to Fraser Island is simple - with several flights leaving Sydney, Melbourne and Brisbane each day. After arriving at Hervey Bay, take a ferry ride to Fraser Island, and enjoy a part of Australia that few know about. For more information on Fraser Island and possible tours visit: http://www.fraserisland.net/.